Do you struggle getting along with others in church? You are not alone. Paul’s first letter to Corinth is about dealing with relational differences, setting disputes, reinforcing God’s view of marriage and divorce, the essentials of public worship, the importance of Jesus’ resurrection, money issues, and so much more. 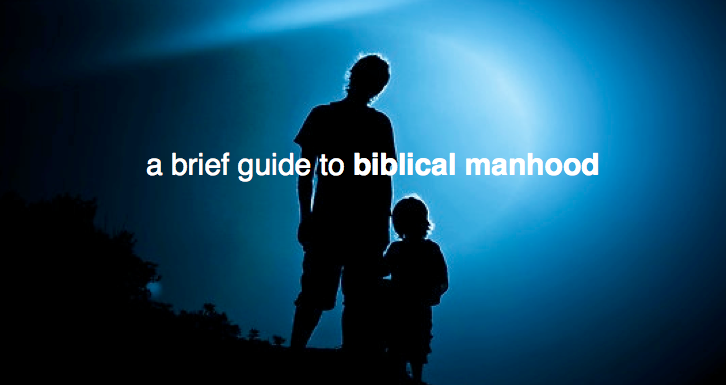 Are you looking for something to study from the Bible? With your family? With your small group? Click below to download a family worship guide 1 Corinthians: making much of Christ in a messy church. You just don’t let anyone in your fridge. Why is that? It could be that there is a mess in there or something you wouldn’t want just anybody to see. That might embarrass some. Yet for those privileged few you give permission to find something to drink or eat from your fridge you have reached a certain level of comfort. Even though there might be a mess, you are comfortable showing your mess because you have nothing to hide. I’ve been walking through 1 Corinthians, a letter written to a messy church (and what church isn’t?). Looking at the church in Corinth is like looking into a messy fridge. It’s a little embarrassing. We see all the faults and fears. Yet it is somewhat comforting looking at Corinth because it’s somewhat normal church. 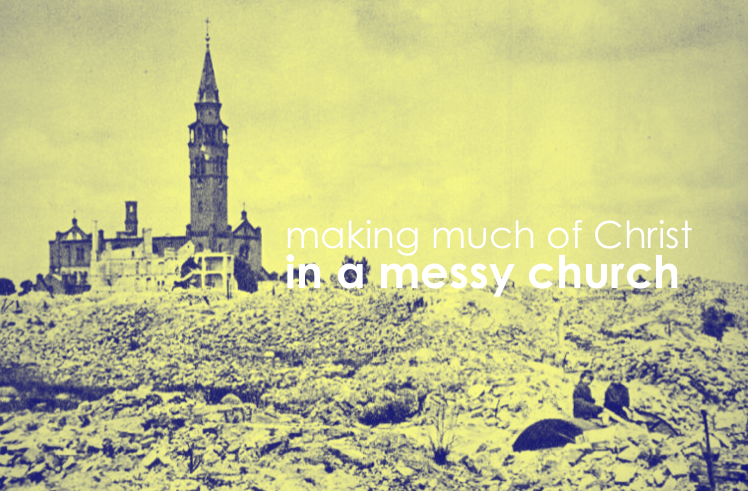 The question I’ve been asking while reading 1 Corinthians is: How can I make much of Christ in a messy church in a messy world? There is no mistake that Paul brings every question and every concern of the church back to Christ (so important!). For Christ is the solution and the center of the church, and if not, the center becomes the mess not the Messiah. Christ has come to be the Messiah of the mess we have made. As I enter 1 Corinthians 8, the question becomes specific: How do I follow Christ (or exercise my rights and freedoms in Christ) while living in a messy world without bringing more messes into the church? To this the Bible gives a mosaic of wisdom that when pieced together helps me to see how I am to live in a messy world. First, seek His kingdom and His righteousness (Matthew 6:31-33). Jesus wants me to think of God’s kingdom and righteousness as two lanes of a oneway street. To seek God’s kingdom is to honor His authority, not usurp it. To usurp God is to veer off the left shoulder of the road. To seek God’s righteousness is to honor His standards, not disobey them. To disobey God is to veer off the right shoulder of the road. Together seeking both God’s kingdom and righteousness help me to walk the road of freedom in Christ when everyone else around me is abusing that freedom. Second, be salt and light (Matthew 5:13-16). Jesus says I live in this world by default. I cannot escape it. Therefore since the world is my temporary home, I must choose to live purely (salt) and shine brightly (light). In the process, by God’s grace, I display the gospel of Christ to a messy and darkened world. Now it is possible to seek God’s kingdom, to seek His righteousness, and to be salt and light, but there is still a missing piece of the mosaic, which is thirdly, love God and your [brother] as yourself (Luke 10:27). This piece is seen in 1 Corinthians 8, which in reality, is that Great Commandment made practical. Loving your brother or considering others in your community of Christ, makes much of Christ. Our text today gives three truths towards loving your brother while living in a messy world. 1) Love your brother, love not what you know (vs.1-3). Paul introduces the issue, “Now concerning food offered to idols” (v.1a) but before dealing with the question of food sacrificed to idols, He comments on related matters: 1) the danger of knowledge about such things and 2) the primacy of love over knowledge as the guiding principle for Christ-like behavior. Knowledge is good, but dangerous. Paul begins by quoting certain Corinthians who thought they were ‘in-the-know’ who said, “all of us possess knowledge” (v.1b) The ‘knowledge’ quoted here is a specific kind of knowledge related to the idols who they knew were nothing compared to the One True God (see: v.4). Their knowledge was theologically spot on. Paul had no disagreement, but what he did disagree with their application of that knowledge to those not in-the-know. Paul saw their knowledge or know-it-all-ness as a danger sign. It is said, “knowledge is power.” Have you ever known someone who was really knowledgeable, knew it and flaunted it? Have you ever possessed a little bit of knowledge and felt it’s dangerous affect? Sometimes the most dangerous Christians are those who gain a little bit of knowledge and wield it with reckless tactlessness like a kid with an broadsword who’s just watch Braveheart. The Corinthians knew a few things about Christian theology, but they became so full of pride and they lost sight of more important teachings, such as loving and edifying others. Love over knowledge is our guiding principle. Paul warns those in-the-know that “knowledge puffs up” (inflates), “but love builds up” (deflates). Knowledge makes us feel important, but it is love that strengthens the church. There is absolutely no room for arrogance in the Christian community. Paul will not put up with it. Not because he is anti-knowledge, but because he is anti-knowledge that is anti-loving. For a swollen head does not equal a swollen heart. Recently, I met a grand marabou at a friends house. Once that he found out I was a Christian he railroaded our conversation by waxing eloquent his view of Islam and the Quran. He might have some good things to say, but it had no effect on me. For anytime I tried to ask a question he refused to answer and anytime I tried to insert a comment he interrupted. After 30 minutes of talking and chanting he finally asked my opinion. I said, “You love hearing yourself talk more than you love me or your God.” I told him I’d like to talk more later, but that I’d come to be with my friend. True knowledge humbles those in-the-know because they realize how little they know. “If anyone imagines that he knows something, he does not yet know as he ought to know” (v.2). Anyone who claims to know all the answers doesn’t really know very much. After seminary, I was a know-it-all. I graduated from Bible College with a small piece of paper and a big fat head. Then I began to pastor and went to seminary. It was then that realized I really didn’t know as much as I thought I knew. When I compared my faint and fragment knowledge with the infinite knowledge of God, there was a humbling that went on within me that was good. I never really know enough until I recognize that God alone knows it all. This text hits me hard because I love what people think of me more than I’d like to think that I love them. That is so anti Christ and it’s an extremely dangerous attitude in the community of Christ. Maybe, you, like me, need to take a moment to reflect upon the infinite knowledge of God and the incomprehensible love of Christ. Love is redeeming. Paul illustrates this by saying, “If anyone loves God, he is known by God” (v.3). The expression “known by God” appears elsewhere in Paul’s writings (cf. Galatians 4:9) as a description of redemption. Paul meant that, unlike the prideful people who center their religious lives around knowledge, those who focus on love demonstrate that they have been redeemed. Christian love is always constructive. It builds up. It encourages. It shows people a picture of Christ who Himself possessed all knowledge yet loved his brothers to the death. He knew-it-all, yet He was the most humble man. // Love your brother, love not what you know. 2) Unite around what you know about God (vs.4-6). Since Paul has laid a foundation for love over knowledge, he now returns to the main topic of concern: “eating food offered to idols” (v.4). He affirms to theological truths those in-the-know knew, first, “an idol has no real existence” (cf. Isaiah 40, Psalm 115) and second “that there is no God but one.” With these statements he resolves the issue that there was no problem with eating idol meat since it had been offered to something that did not really exist. Now Paul is not minimizing idols, rather he is magnifying the God of Israel. The One True God compared to every other god is a non-comparison (vs.5-6a). Moreover, there is but “one Lord, Jesus Christ through whom are all things and through whom we exist” (v.6b). These verses take the form of an early catechism or hymn of praise to God the Father and God the Son that all Christians could unite around. How should theology unite us rather than divide us? For example, as we see how the Father and Son relate to one another, we also see how we in the church must relate to one another. That’s practical and applicable theology! It will get even more so next. Next, Paul shares a case study (vs.7-13). He introduces us to someone “not” in-the-know (revealing a wrong assessment of the church; v.1). Likely a young Christian recently saved out of a life connected to the pagan temple. To this new Christian, eating idol meat poses a serious concern, if not sin. For him, every shopping trip to the market, every town festival, every dinner party or BBQ with the locals presented a quandary. And one day, he sees a strong and respected Christian at a local restaurant likely affixed to a pagan temple and he has a bigger quandary, “If it’s okay for him to eat idol meat, then it must be okay for me to sin too.” He then syncretizes his new found faith in Christ with his former lifestyle in idolatry. In case you did not know, there are varying opinions and consciences within the Body of Christ. That’s okay. The church will always be filled with new, old, mature, immature, strong or weak believers. Even though we have great freedom in the gospel and our freedom grows as our understanding grows, we must be willing to sacrifice freedoms for the sake of one another. It is no trivial thing, for when we cause other brothers to sin, we ultimately sin against Christ. Remember when God asked Cain where his brother Abel was and he responded, “Am I my brother’s keeper?” Essentially, that is the type of attitude Paul is addressing in 1 Corinthians 8-10. Paul responds to the Cain’s who bring their offerings and worship to church, but do not love their fellow brothers rather they lead their brothers to destruction. Paul is willing to become a vegetarian to protect his brothers growth in Christ. He expresses in words how love trumps knowledge. Wouldn’t you be willing to give up going to dinner for your brother? Would you be willing to sacrifice your opinion of the style of worship service or social rights for your brother? Are you willing to follow the example of Christ who Himself gave up everything? Remember, it always comes back to making much of Christ. Can you think of a church member or brother or sister in Christ you have a hard time loving? What about them is hard to love? How could you love them better? Would you take a moment to pray for them and a God-given love towards them? Lord Jesus, we are delighted that you were so principled that you cared about the lost, the weak, and the worldly. We are so grateful for your tender mercy and unconditional love. Now, O Lord, give us the same love for others, that we may honor both you and them. In Jesus name, Amen. What do all soap operas have in common? Soaps have a never aging cast. They are predictable, yet still leave their audience surprised. They are scandalous, yet acceptable to the masses. Soaps live up to the name “daytime drama” filling plots with family messes, immorality, and power trips. After a quick reading of 1 Corinthians, you’d think it was a script for an episode of “Days of Our Lives” or “Guiding Light”. Corinth is a church wracked by division, money problems, and immorality. Certain church members are visiting prostitutes while others are promoting celibacy. One leader is having an affair with his step-mom and rather than dealing with it the church accepts it. Corinth is a mess. Does this church sound like any you know? If we were honest, the first century church of Corinth resembles the church of our century. That’s why Paul’s first letter to the Corinthians is one of the most relevant books in the Bible for the current church (and church goer). It is for people struggling to live together inside the church and live for Christ outside the church. It’s a letter for Corinth and a letter for you. History of Corinth: To understand Corinth, you need to understand its history. The city itself dates back to the Peloponnesian War (431 BC). It became a Greek city-state and the seat of the Achaean League under Alexander the Great. Later, Corinth was destroyed by the Romans (146 BC), but 100 years later it was rebuilt by Julius Caesar (44 BC). So in Paul’s day, Corinth was newly rebuilt and revitalized. It is easy to see how the church and Christians at Corinth would be influenced by its community. Corinth was a messy town with a messy church. Yet what town or church isn’t messy? Corinth could be any town or any church. It could be your town and your church. Paul grew to love the Corinthians with Christ-like affection, though he never had to deal with any church so inflated, so immoral, so indifferent to his sufferings, or so cheeky towards his teaching. To understand Paul’s unconditional love for the church you need to travel back in time a few years to the beginnings of his relationship with the city. Origin of the Gospel in Corinth: Paul was driven to Corinth (50-51AD) after a difficult time in Thessalonica and Athens (Acts 17:1-34). He didn’t go alone, but was assisted by Priscilla and Aquila, his tent-making buddy. Soon after arrival Paul preached the gospel (Acts 18:1–18) and opposition grew fierce. Discouraged, Jesus spoke to Paul in a vision assuring him that He had ‘many people’ in the city (Acts 18:10). With this encouragement, Paul stayed for 18-months, ‘teaching them the word of God’ (Acts 18:11) and a new church was born. Origin of the First Letter: A few years later (54-55 AD), while in Ephesus (vs.16:8-9; Acts 20:31) ‘Paul the Apostle’ (v.1) penned this letter the “church of God, which is at Corinth,” (v.2a) likely, many small groups meeting in homes. To Paul, a letter was better than a phone call, but not as good as a visit. It is obvious, Paul’s love for Jesus and the church are intertwined and dripping over every word. Proof of his love is seen in the sizable greetings and thanks portion of his letter (vs.2b-9). What Paul also reveals is the theology behind his love for the church and how we should think about the church. First, it belongs to God (v.2a). Second, its members are sanctified in Christ and becoming holy (v.2b). Third, it is made up of all those everywhere who call on the name of the Lord Jesus Christ (v.2c). Fourth, God is faithful to it. These are universal truths about any church anywhere at anytime. What’s not to love about the church when you look at it through these eyes? What do you love about the church? How do you express thanks for it? Paul’s original mission to Corinth was successful. Crispus, the ruler of the synagogue, was baptized, with all his house. He started meeting in a room near the synagogue, which was made available by Titus Justus. It was there Paul preached for many months. What did he teach them? He taught them from the Law and the Prophets about Jesus. What do you think he had wished he had taught them? Probably nothing different, knowing Corinth. This is a great lesson for us to make Jesus the central topic of our discussions and teachings. What happens when Jesus in not made center? Corinth becomes the case and point. Here begins one of three different segments of the letter to the Corinthians: divisions (v.10). Who is it that reports division to Paul? (v.11) Chloe’s house. What’s the reason for division? (v.12) Certain leaders had “groupies”. Christian celebrity worship is not just a 21st Century thing. The first century church had groupies too. At Corinth(ian Idol), the “groupies” rallied around either Paul (the founder), Apollos (the pastor), Cephas (the rock, Peter), or Jesus (the One and Only). It’s uncertain how the cliques formed, yet the text gives clues that is concerns the one who baptized them (v.13) or tickled their intellect (v.17). And what about the “Christ” groupies? Likely they were pious groupies. In either case, when Jesus is not the undisputed center of your life, ministry or church you flirt with idolatry. How can we minimize groupie-ness? Notice how Paul does it (vs.13-16). He simply, yet emphatically points to Jesus. The thing for which to watch for is the way in which Paul consistently relates every subject and problem in Corinth to the centrality of the Person and work of Jesus Christ (v.17). Paul’s cure for division in the church is unifying around the gospel of Jesus Christ. Paul’s has a “we’re not alone, we’re in this together” view of the church. To him, if the church would just acknowledge its ultimate allegiance—Jesus—then the church would have a much better probability of getting along. Later, Paul uses a beautiful image to describe the church as “one body, many parts.” (12:20) and Jesus as the “Head of the Body, the church” (Colossians 1:18). Regardless of our differences, indifferences, and messes, the church is still Jesus’ beautiful Bride (Ephesians 5:23). It’s a beautiful mess because Jesus is its center. If Jesus is your undisputed center, people will think you are foolish (vs.18-21). Paul echoes this by saying there are two types of people in this world: 1) people think the cross is the idea of fools or 2) people who think it’s the wisdom of God. There isn’t much room in between. The gospel message doesn’t rest well with the populace. It’s just not cool to be Christian. Never was and never will be. Remember, before Paul came to Corinth he reasoned with the intellectuals and philosophers on Mars Hill in Athens? They thought he was a fool—a babbler—and mocked him. Paul could wax profundity with the best of them, but on his way to Corinth, he determined to shelve all “human” wisdom and eloquence, instead he preached the gospel in its uttermost and humblest simplicity (v.23; cf. 1:17; 2:1–5). How do we begin to compare the power and wisdom of God to man? There is no comparison. “The foolishness of God is still far wiser than man’s most wisest thought and the weakness of God is still far more powerful than man’s most strongest feat” (v.25, my paraphrase). Is God “foolish” or “weak”? No. So why does Paul use the words “foolish” and “weak” to compare God and man? He is showing how polar opposite the power and wisdom of God and man really are. Comparing God to man is like comparing the power of gravity with a refrigerator magnet. I felt like a fool this week. While walking through my neighborhood I saw a group of guys I’ve visited before sitting outside their gate. They greeted me from a distance and welcomed me over to them. There was a new man in the mix, a well-dressed older man with a whitening beard. He immediately asked me if I was Muslim, which is a common question since I speak a little Arabic and sport a beard too. I said, “No, I go the way of Jesus the Messiah.” He quickly responded, “So do I. I go the way of all the prophets. Do you go the way of the prophet Mohammad?” I said, “No, only the way of Jesus.” He then opened the gauntlet, “Do you believe Jesus is the Son of God? Do you believe in three gods? Can God be a baby? Can God die?” I was being shredded, gut-checked, and mocked. I felt so unloved, yet so calm. My only response was, “Can God can do the miraculous? (i.e. Create something from nothing, cause the sun to stand still, part the Red Sea, raise the dead, heal the sick) Have you read Jesus’ words in the Injil?” My questions and invitation seemed to rest on deaf ears. I said my goodbyes and left feeling like a fool, moreover, I was filled with sorrow for their souls. The Corinthians forgot something important, which we often forget too. They thought they were somebodies, but forgot they were nobodies. They were proud and thought they arrived. They forgot they were weak, lowly, and despised (vs.26-29). The words “low” or “despised” are often used of slaves. Interestingly it is estimated that 400,000 of the 700,000 residents of Corinth were slaves. Not everyone in Corinth was the “cream of the crop.” Do not forget who you were before Christ. How do the words “low” and despised” remind you of Jesus’ own entrance into this world? Jesus was born in a manger, He worked as a carpenter, He hung out with sinners, He did not claim to be the returned King yet, and He suffered a criminals death rejected and despised. Jesus was the humblest, strongest and wisest man to ever live. I’ve got nothing. When I stand before God at the end of my life, my brawn and brains will not be enough, my dollars and donations won’t amount to much, my good works or merciful acts won’t stack up. To boast in my little stack of stuff is silly. Nothing I boast in tops out Jesus Christ. He gives me serious grounds for boasting (vs.30-31). When I boast in Jesus, I boast in something God the Father and God the Spirit also boast in too. I want to make much of Jesus Christ. No matter where you are or live the church is messy (like a soap opera), however, Jesus is still the founder and sustainer of it. 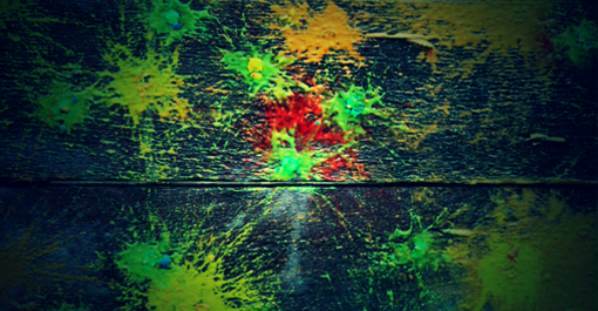 It is His, He bought it with His blood, and it’s His living organism in the world today bringing people to Himself. May you serve the church of Jesus joyfully, especially, as you go to hard to reach places with hard to reach people who think your message is foolish and feeble, or disciple messy believers. Like Paul, you are in good company. Make much of Christ.